Why did some dinosaurs have giant hollow bones in their backs? 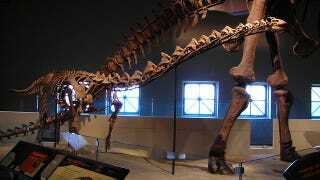 Rapetosaurus was a huge, plant-eating dinosaur much like the brachiosaurus. It's one of a family of dinosaurs that had a huge, hollow bone growing in its back. Known as an osteoderm, paleontologists are only now discovering what it was for. Osteoderms are still found today in creatures throughout the animal kingdom. These bones, which are actually embedded in the skin, are what create the scales on the backs of alligators and the armor covering armadillos, not to mention the famous plating found on dinosaurs like Stegosaurus. As for the long-necked plant-eating dinosaurs, more technically known as sauropods, an entire subgroup of these dinosaurs had massive osteoderms in their backs. Paleontologists have debated what purpose these served for well over a century, with theories ranging from armored protection to mating displays to regulating body temperature. "This is the biggest osteoderm ever found for any backboned-animal. The fact that it's hollow debunks all sorts of ideas about how these bones functioned in long-necked dinosaurs. Knowing something about the lives of these dinosaurs, particularly in the context of the drought-prone paleoenvironment they lived in, tells us that osteoderms may have been important for storing minerals, which allowed Rapetosaurus to survive the rough times. "The discovery of these giant osteoderms provides new insights into what these bizarre structures may have done for the dinosaurs that had them. It helps us clarify what these Madagascar dinosaurs looked like with their skin on. Our sample also includes both adult and juvenile osteoderms, which tells us how the osteoderms changed over the lifespan of the dinosaur." While most living animals have tons of interlocking plates, Rapetosaurus only had a few big osteoderms. These wouldn't have been suited for temperature regulation, and the fact that they're hollow makes it more likely that they were used for storage. Via Nature Communications. Image by Lisa Andres on Flickr.